If you need a new pair of earbuds, why not get a pair with your favorite MLB or NFL team on them? 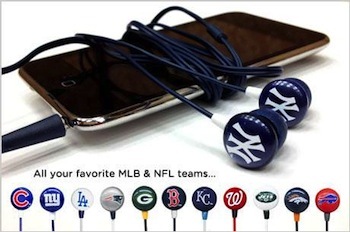 Eversave is currently offering a pair of MLB or NFL earbuds from iChameleons for just $2. Shipping is $6, so your total will be $8 shipped, or 73% off the retail price of $29.99! These will work with all iPhones, iPods, iPads, and MP3 players; basically anything with a headphone jack. May buy up to 5 Saves. $6 flat rate shipping and handling applies per pair of earbuds. Promotional value expires on Feb 16, 2013.